“It will help us every day, it will brighten all the way, if we keep on the sunny side of life.” So goes the chorus from the song popularized in 1928 by the famous Carter family, but the song is also known for being in the year 2000 movie “O Brother, Where Art Thou?” This song, the movie, and the general time frame of both have inspired me to make a bright and daily-life type of summer 1920’s dress together with a hat re-worked into a 20’s cloche. There isn’t anything like a great outfit that you love to be in to help brighten up a disposition and add to a great day. 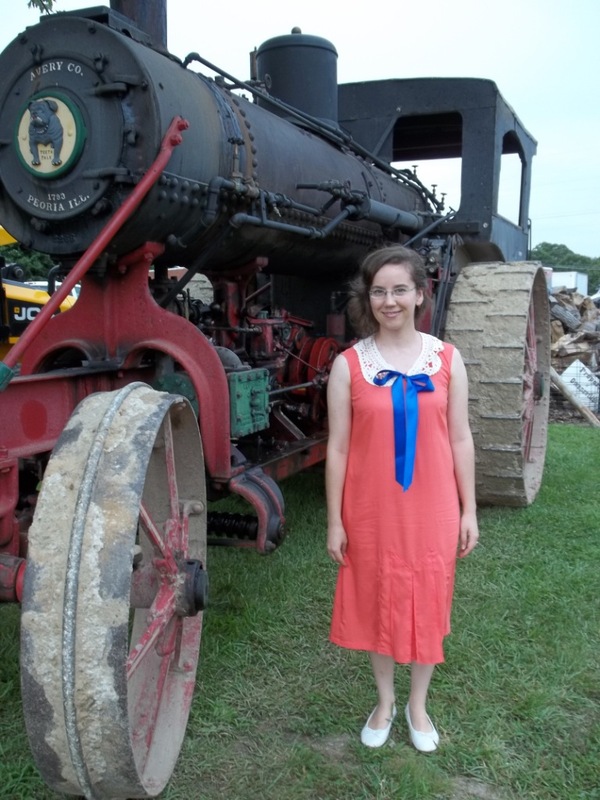 A vintage tractor show in a small town only a day’s trip away was the catalyst behind my creation. 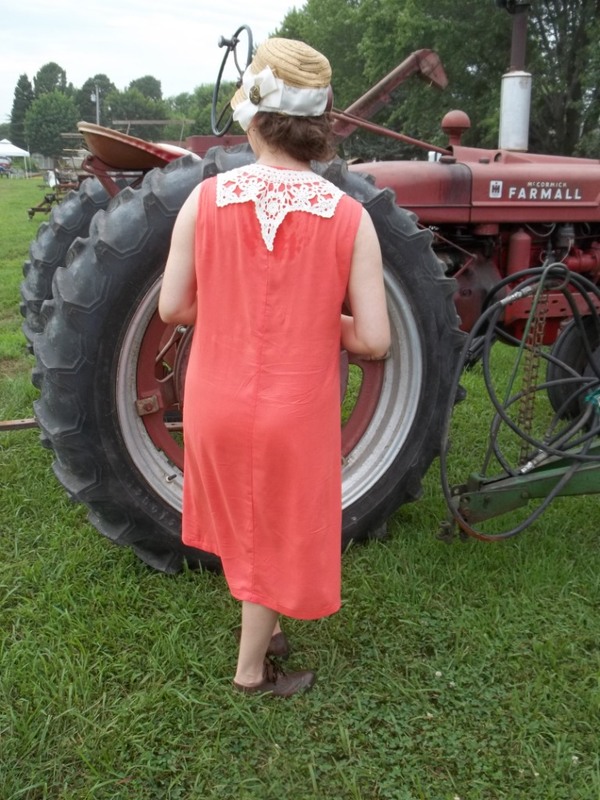 The occasion was a dusty, farm-centered, old-timey day of laid-back enjoyment which completely reminded me of something out of the depression-era dust bowl, the general setting of the movie, “O Brother, Where Art Thou?” I don’t know what was brighter that day…my dress or the summer sun. 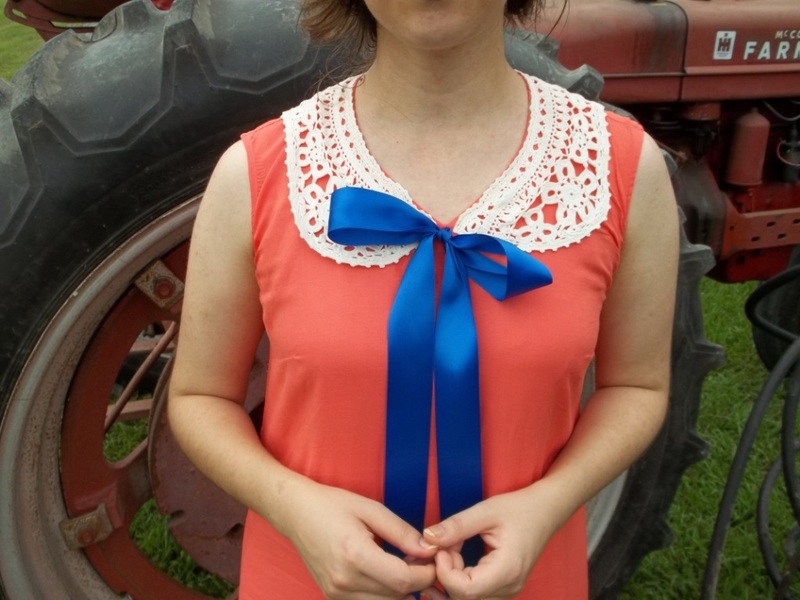 NOTIONS: I had all the thread and bias tape needed, but I had to go out and buy the blue ribbon the day before my dress was worn. The collar is from my stash, as was the hat ribbon and button (which was from hubby’s Grandmother). TIME TO COMPLETE: The dress took me about 8 hours, and was finished the day before the event, July 18, 2015. 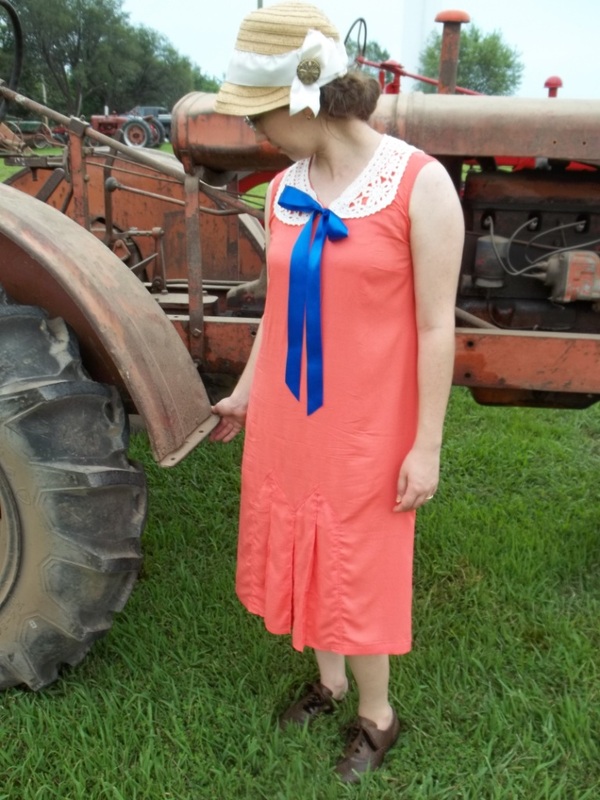 I had been sitting on the idea for this dress for a while but when we decided at the last minute to go to the vintage tractor show, it gave me the reason to whip this up from off of my sewing table. I am glad I had a reason to wear it because it seemed harder in the thought process than it was to actually make it. This is the cutest loose fitting sack dress I could have ever imagined. My dress being from the 1920’s is (I suppose) the only way to reconcile mentally my wearing something so generous. My cloche hat doesn’t do much for the sun but is a good match for what I believe is a decently historically accurate 1920’s ensemble. 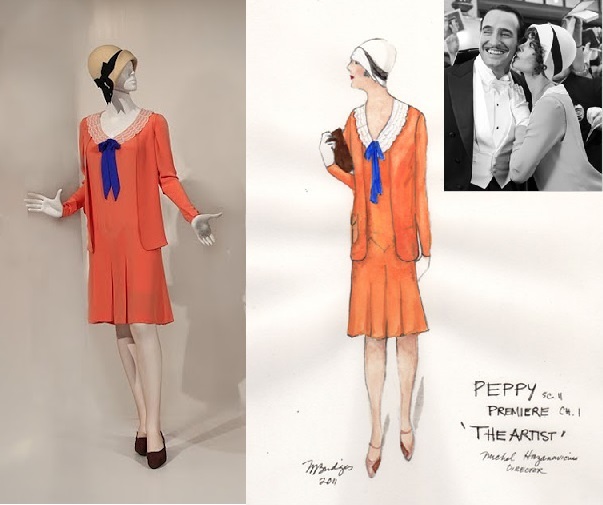 My preliminary inspiration was from a Hollywood source –Bérénice Bejo’s character Peppy Miller in the 2011 movie “The Artist”. Our first sight of her in the movie is when she is wearing a jacket over a dress very similar to the one I made. The movie dress, however, has long sleeves with a sleeveless vest/jacket, but to make my outfit versatile, my dress is sleeveless and a long sleeve jacket will be sewn later. I even tracked down a costume sketch so I could see all the original colors which I stuck to as well in my version. Part of the reason for the use of odd colors on the movie dress was so that things would show up a certain way in grey toned colorless film. Nevertheless, the early/mid 1920’s into the 30’s are classic for pairing and using bright and unusual colors (reflective of the positive outlook of the times, see this as one example), so as wild as a bright salmon peach and royal blue sound, there is a high probability they were matched. Honesty, I love the finished look. 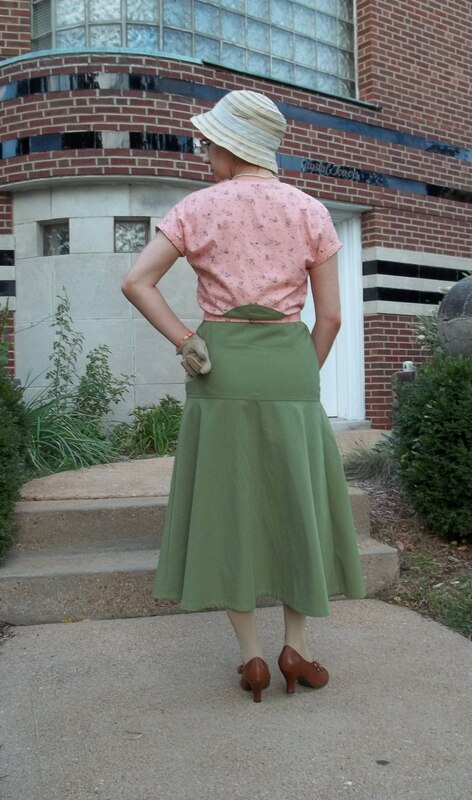 To start with, I used my easy, two-piece, fall-back basic Butterick for my 20’s shift silhouette. It has been used with great success already for two other 20’s era creations – a blouse and a satin dress. This time, I had to do some detailed adjusting of the neckline so it would suit my chosen lace collar. 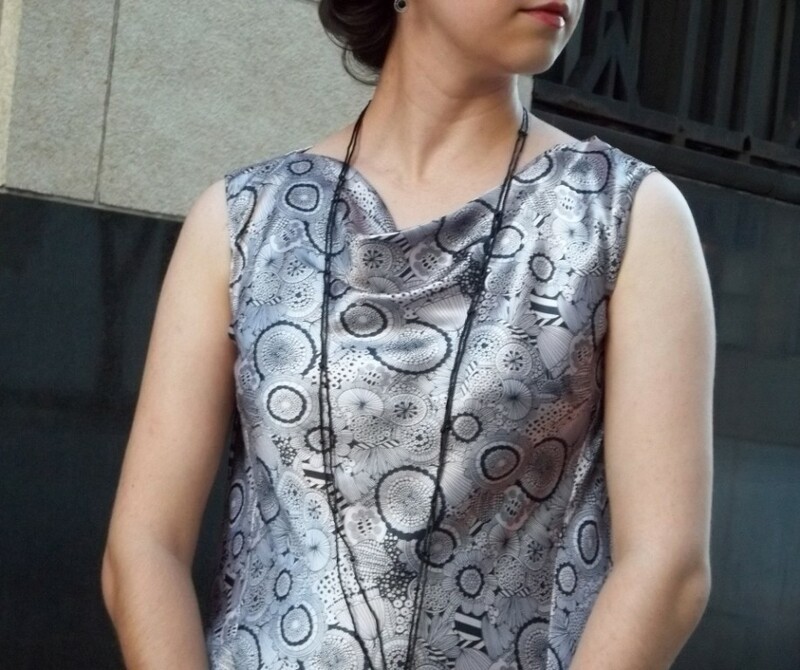 I also opted for the easy and quick bias facing for the neck and arm hole finishing as the rayon is a bit sheer. A deep hem was made so as to weigh down the dress a bit. 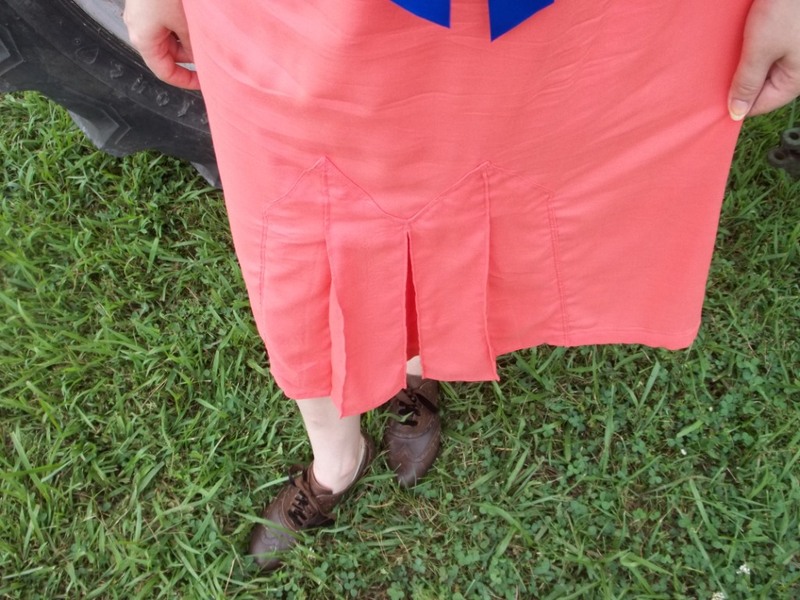 With the dress done in a jiffy, I figured out how I wanted the center front skirt insert to be pleated and made a draft from plain paper – a box pleat in the middle and plain knife pleats on each side. Then I made the real version of the pleated skirt insert and top stitched it down before cutting away the dress fabric behind. This process reminded me of opening up a window. That was all! With only some quick hand tacking of the add-ons, my dress was done in the blink of an eye. Many mid and late 20’s dresses have similar center front skirt interest which adds room to move. My parents (on occasion) pick up vintage items they know I don’t have but are uniquely special, such as collars and unique notions, with the occasional accessory. Making this dress gave me my first occasion to use my now substantial lace collar collection, all found by my parents. I believe this particular collar that I used is not too old, but I really don’t have any idea besides I think it’s hand crocheted. It is so lovely the way it has such detail and I love the pointed dip in the center back. The neckline ribbon is merely pinned in place with a safety pin because I really don’t think modern satin ribbons wash well…and I don’t want to try just to find out. After having the rest of my dress be vintage appropriate materials (rayon and cotton), I regret having a poly satin ribbon, but I have limited resources and my dream materials might have to stay that way. The ribbon does have a nice dull shine and it does give my dress the right amount of cheery fun. My hat is my first attempt at re-fashioning head wear. I don’t think it’s too shabby. My methods were primarily sewing and folding rather than soaking, re-blocking and shaping. It was a cheap basic shaped hat originally, similar to the hat I used for this re-fashion. My problems with this hat are purely on account of me – 20’s hats are so darn close fitting and my hair gets so frizzy on hot, humid days that there is no room to hide all my locks! I can get away with this somewhat with winter cloches because the wool sticks to my hair, but this straw one does not. Besides, I need my glasses to see and for some reason this hat interferes with my eyewear. However, my hat is a success and fills in a niche by completing my 20’s wardrobe for summer. I did not cut into the hat at all but folded in the back brim into the crown. The sides are folded like tacos and covered up by the ribbon. Everything is invisibly hand tacked own by clear filament thread. Eventually, I might like to rip all this apart and do a better job (because I can) but it would be easier (and more fun) to probably just make a new hat. 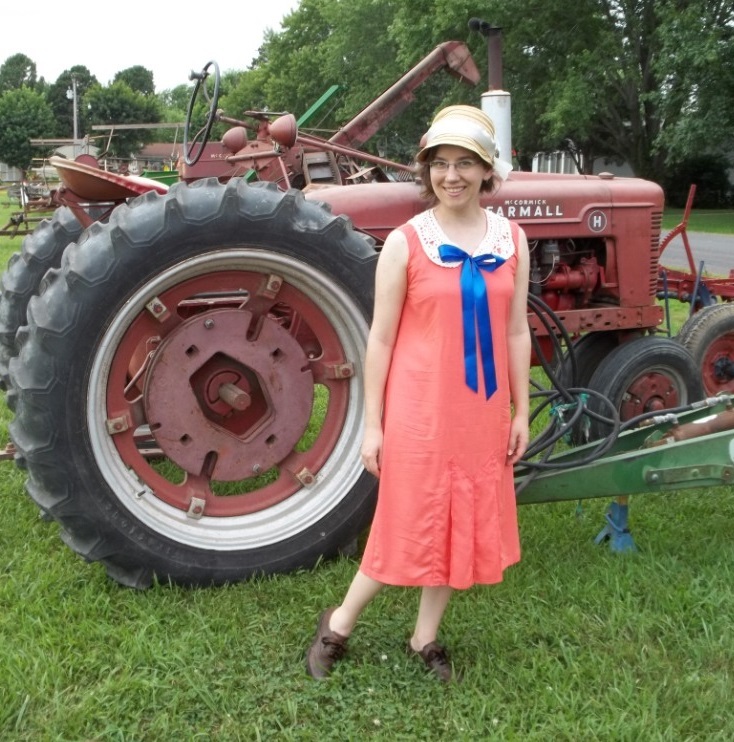 Technically, I believe the tractors behind me in most of our pictures are not really my dress’ era but probably 40’s or 50’s. They did have some breathtaking 1910 to 1915 still working steam powered tractors for some historical awesomeness. Although my hat is breathable straw, standing next to piping hot steam engines running in the height of summer was a bit overwhelming, but without the cloche my outfit suddenly had a 30’s aura. Watching those old machines still working makes me realize how the times before ‘The Depression’ had such a swaggering confidence. 1920’s ingenuity is often overlooked because it is so far back and different than our modern technological advancements but most of what we take for advantage has its roots in the 20’s – television, synthetic fabrics, traffic signals, sunglasses, refrigerators, washing machines, and frozen food, to name just a handful. In strong simulation of the famous Madeleine Vionnet, this Burda Style dress is perfect for modern day glamour a la 1920’s. My fabric is a silvery pink satin. With its frosty sheen and surrealist clock “cog works” print, the fabric reminds me specifically of the cold, hard, mathematical beauty that I love about the Art Deco era. The dress, in classic Vionnet style, is on the bias for a flowing, body complimentary gown the likes of which are not seen that often in modern patterns anymore. I love this dress! 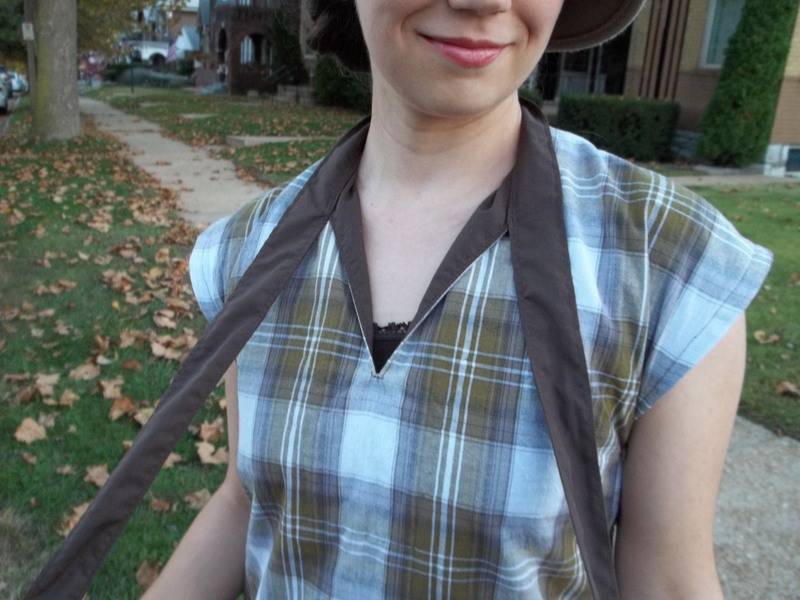 I am not exaggerating – this is one of the most ingenious designs I have come across in my sewing. It’s so simple yet so complex and so smart. Just a few geometric shapes cut in the right grain line makes all the difference. Vionnet had the foresight and ingenuity to create very similar styles, but Burda made this kind of dress reasonable in price and availability as a great option to going with a pricey hard-to-find old 1930’s/1920’s original patterns (at left)…without compromising authenticity. Yes, believe it or not the 1920’s was more than just beads and fringe – it was also about bias cuts, freedom to move unconfined, and mathematical glamor. PATTERN: Cowl Neck Dress #102, from 07/2012, on Burda Style’s store online or in the July monthly magazine issue. NOTIONS: I had the interfacing and thread I needed, as well as the money coins which went into the fabric weights for the dress’ inside. THE INSIDES: As this is on the bias, all seams are left raw and free. TIME TO COMPLETE: This was made quickly in about 6 hours, and finished on August 8, 2014. This was my first Burda Pattern to make and I’m glad it was a success. The instructions for the neck/bodice all-in-one facing were quite impossible to understand merely reading but as long as I followed them to the letter in my sewing, as weird as they sounded all worked out great. I didn’t do any changes to the pattern. Besides fitting in the sides, I kept the proportions and length as-is. As for any Burda Style pattern, printing and/or tracing is necessary to have a usable pattern to lay on your desired fabric. My pattern was traced out using a roll of medical paper from the insert sheet of the magazine issue but you can also buy it, download it, and print it out from Burda Style’s online store. It’s at this preliminary step that you pick out your proper size and add in your choice of seam allowance width. 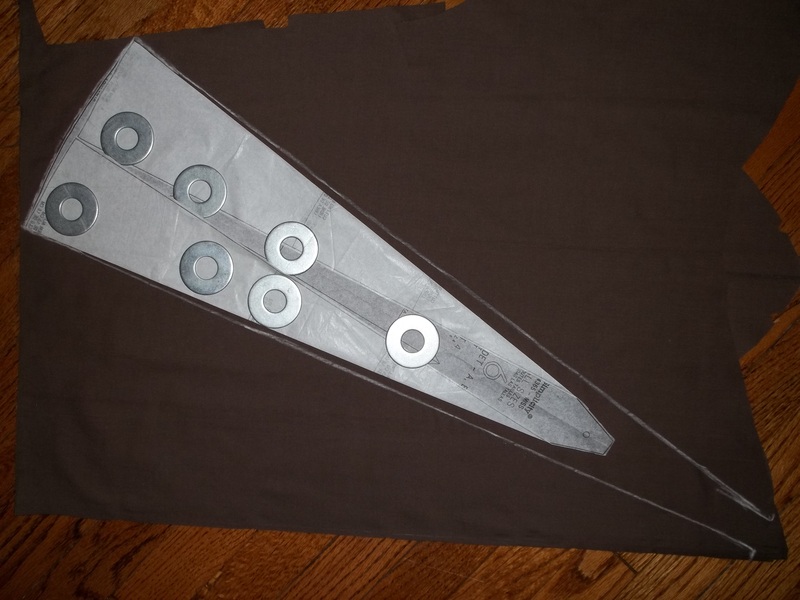 A scissor with a magnetic ruler guide helps immensely to quicken along the step to getting a finished pattern prepped. Sorry to repeat something you might already know, but this is just an “FYI” for those that don’t know. Usually I grade from my “normal” Burda size (usually the smallest one offered) up to the next size for the hips but for this pattern I made the whole dress out of the size for my hips, just to be on the safe side. However, I ended up taking in each side a few inches. I don’t know if the bias is making the dress size seem so big or if it’s truly the sizing but either way for more of a body fit, rather than a loose and overall drapey fit, go a size down. Now that I’ve made a few bias garments I’ve found there is a delicate balance. 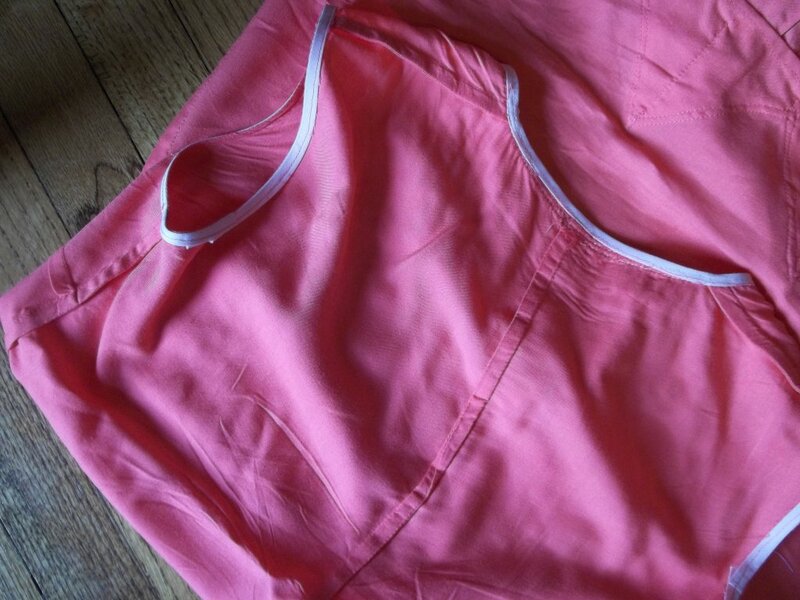 A loose fit is needed so the bias does hang a bit on the body (you don’t want the bias stretched over you) but yet too much ease can make bias dresses look bad and frumpy with draping and wrinkles in the wrong places. The vertical sides of the dress are on the bias, but the side panels take turns with the main body of the dress to change things up. There is the straight grain on the semi-horizontal downward edges of the panels while those corresponding seams of the dress are on the bias. I had to be careful of both differing grains to ease in the fullness and yet also not stretch the bias in those spots– slightly tricky. Bias cut also means no closures, no darts – just simple beauty. Sweet!!! While on me, if I pinch the dress and pull it out it could just keep going. When putting this on, it falls open wide so it seems like a giant dress but then once it comes on over the head it magically falls around my body to fit. Bias cut is so awesome yet so sadly unknown by the general non-sewing populace (at least from my experience). I really don’t know why but the high-low hem didn’t turn out as obvious as in the pattern’s line drawing. The high-low hem was a trademark of the late 1920’s and very early 30’s, which is why this dress is part of my “Retro Forward” blog series. Around the time of the stock market crash of 1929, hemlines became more modestly transitional to the mid-calf skirt/dress lengths of the 1930’s by being frequently part short (like the 1920’s) yet getting elongated (mostly visually) by also being partially long. Thus, during the transition of the 30’s and 20’s all sorts of hemlines became popular such as “high-low” hems, “hankie” hems (see this post), fur trimmed hems – and the variety doesn’t end there! I find it funny how I still see many of these hemline styles in modern clothes. 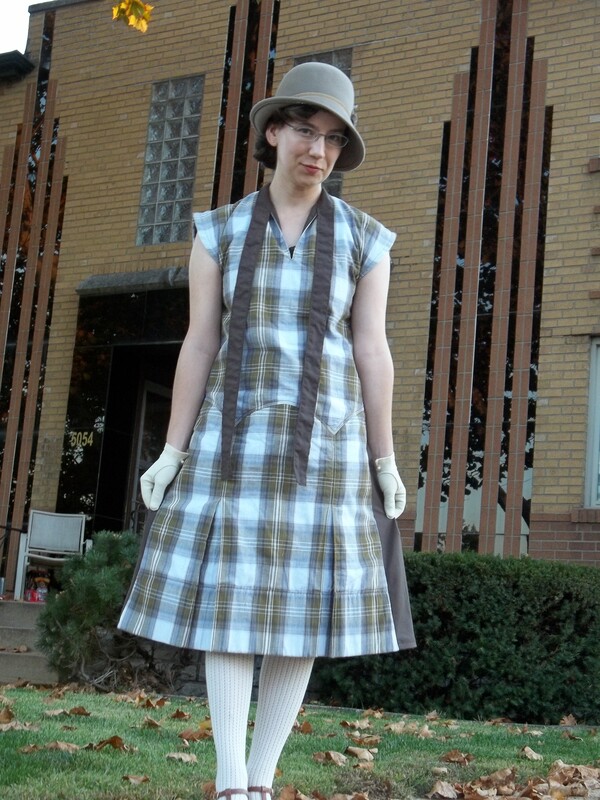 Also, this Burda pattern is totally a Tango dress…similar to Folkwear’s version. Many varied length hemlines were seen on dresses styled with a Spanish influence to be worn swaying to the then “new” music craze of the Tango. Dancing that required full movement of the body was then not only popular but actually possible, too, for corset-less unconfined women in the late 1920’s, and crazy hemlines with body hugging bias cuts made the dancer seem all the more exotic. 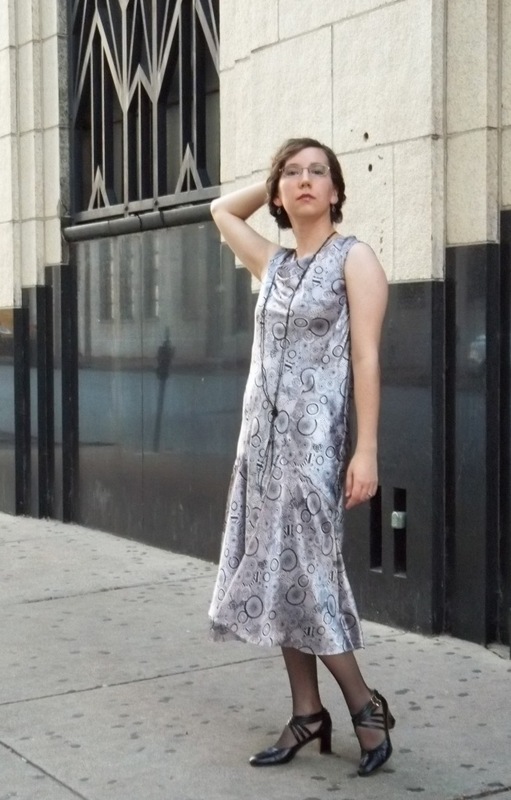 This dress can easily go modern, but I preferred to glam it up ‘a la’ late 20’s style, with my fishnet stockings, bobbed hair, and my handmade long beaded necklace. My Tango-style shoes are (I think) “1960’s does 1920’s” – they are “Debs” made by the famous Palter DeLiso footwear designer. Even our background has the same time period and the same geometric shapes as my dress. The building behind me is one which I have long admired and I happy to be integrating it into a project’s photo shoot. It was built in 1930 as a power-station for an electric company, it is so awesome for such a mundane use, but that is the Art Deco movement to put glamour in everyday life. The National Register of Historic Places Inventory for this building (page 16) lists it as “having metal grillwork in an abstract chevron-like pattern fills the rectangular openings” between the terra cotta and marble of the piers on the building. “Above the openings of the spandrels, between the piers, large stylized ornament, linear, with hard edges, embellishes the parapets.” Aren’t those details amazing?! Sorry to go into detail here but I love historic architecture appreciation, and this building is up there on my “favorites” list so I can easily get going! I hope you like Art Deco like I do and hopefully this post can inspire you look for this era’s buildings in your town or even to work a little of this era into your sewing. 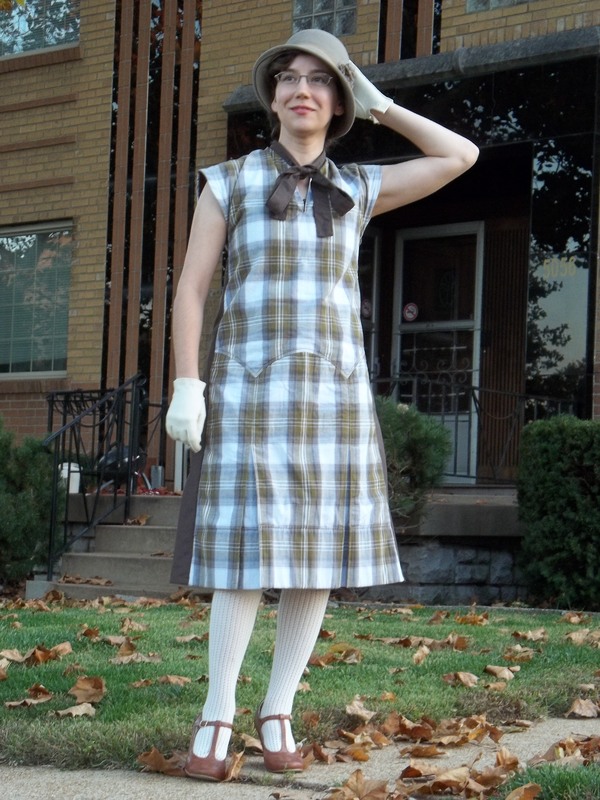 Have you tried bias garments, especially these geometric 20’s and 30’s ones with beautiful simple design like this dress? If you have, they’re special aren’t they?! If not, you need to go ahead and make one…let me know about it…I’d like to see it! Yes, red velvet is definitely lovely, and it’s a sweet treat whether it’s a cake for consumption or a fabric for wearing. 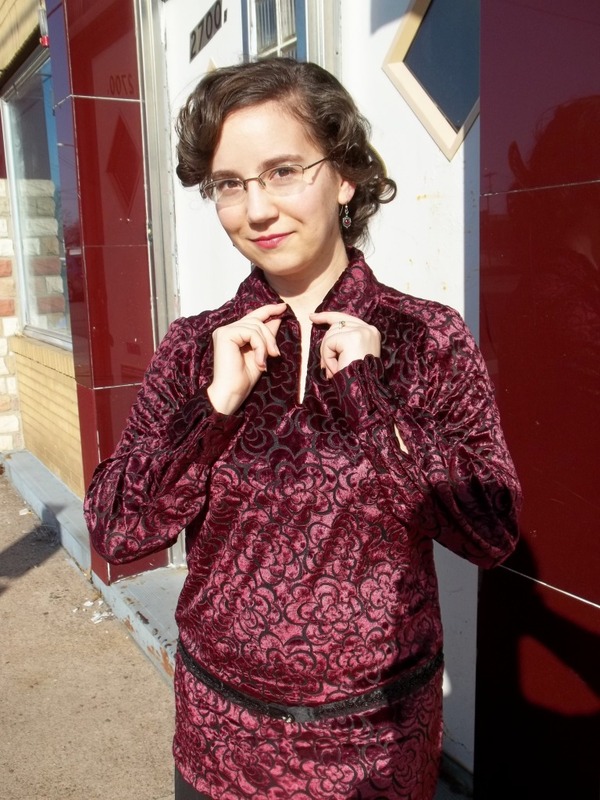 In this post, it’s a 1927 blouse! Shirts and blouses are a staple to the human wardrobe for ages, so there’s much to change while still staying the same through the past decades of the 20th century. Totally un-like a red velvet cake, this blouse is no-calorie and very appropriate for a party. It’s also made from a lovely, basic, vintage pattern which lets the fabric shine! 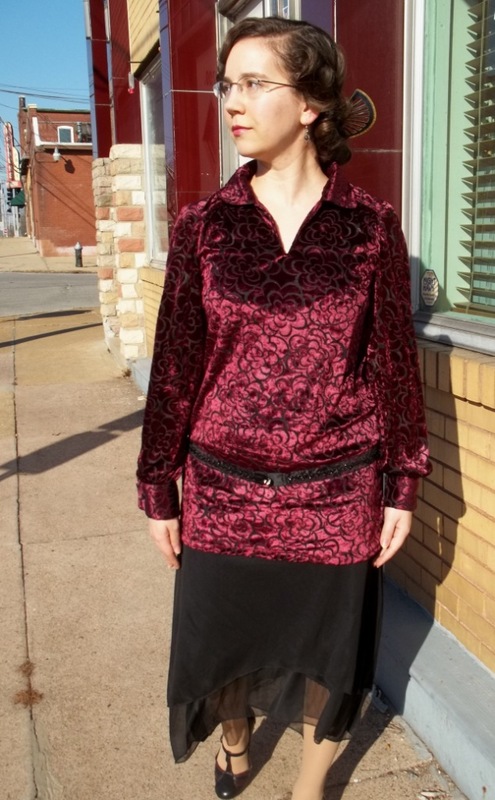 In this case, I chose a fancy, deep burgundy burnout velvet to make an outfit for a St. Valentine’s weekend wedding we were attending. FABRIC: A 97% polyester lycra stretch panne velvet, with a floral burnout design in deep burgundy red showing a black netting underneath. This fabric was bought from Fashion Fabrics Club. NOTIONS: Everything I needed for the blouse was on hand already – the interfacing, the thread, the hem tape, and the buttons. I did buy the beaded ribbon for the belt from a Hancock Fabrics store just a few days before wearing it, but what I used to finish that was also on hand. TIME TO COMPLETE: This blouse took me about 8 hours to make and it was finished on February 11, 2016. THE INSIDES: All the inner seams are in French seams, except for the armscye which is left loose and raw. Oh, and the drop shoulder seam is covered in hem tape. TOTAL COST: The ribbon belt cost about $5.00, and the burnout velvet cost about $19.00 for just over 2 yards, so $24 in total cost. I am very pleased with this blouse and its pattern. The pattern is some modern re-print or re-issue from based on the McCall archive drawings from 1927, and I found it is easy to sew, simple to understand, and fitting true to size. I was technically in between sizes, so, looking at the generous finished garment measurements, I decided to go down to the size smaller. Perfect! The blouse is loose enough to have the proper 20’s style bagginess, but yet somehow it seems to me to be just fitting enough to also be my size. There is a slight curving shaping in the side seams, which further impresses me as well as the lovely gathering at the dropped shoulder seams in the front. My fabric is a non-authentic polyester, I know, but rather proper-looking, and much easier to sew as a ‘burnout’ than as a regular panne velvet. My velvet also has a wonderful weight and droopiness which makes the sleeves so very elegant. 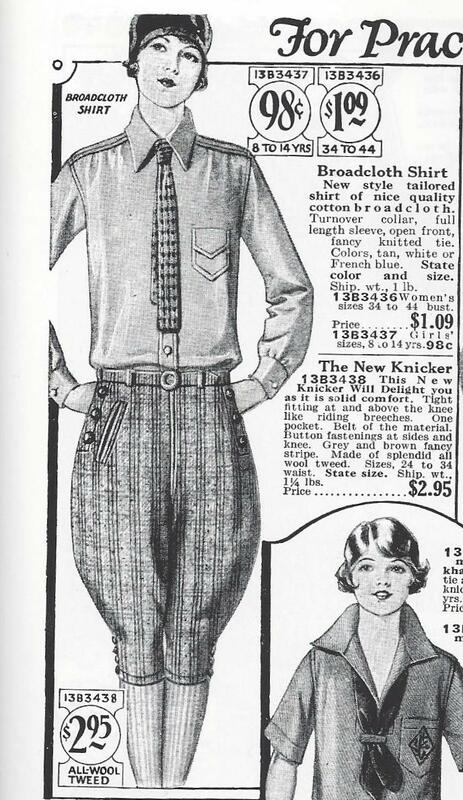 However, I can also see this blouse being wonderful sewn up out of a soft handkerchief-weight cotton or linen (see the 1927 Sears ad at right from here) as basic starting point for an ‘everyday’ 1920’s wardrobe piece, going with a suit set, a jumper, or a skirt. Even though I was working with a burnout stretchy velvet panne, I still sewed it like it was a woven in the way I did not let any of the seams stretch. 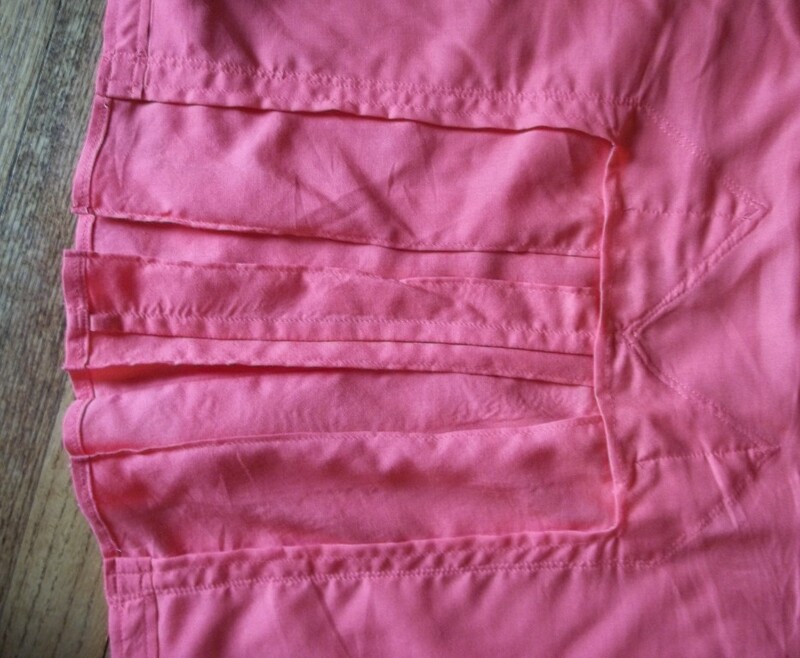 The seams are stabilized with hem tape and/or multi-layers of tight straight stitching. The velvet blouse is slightly heavy because – of course – it’s a long sleeved tunic with a lot of fabric and it needed to hold its shape. Everywhere else there is room for the fabric to give, just not at the seams and I believe it really works best this way when using a fabric with stretch for this pattern. A special interfacing went into my blouse. Being a burnout and slightly see-through, I used a black interfacing. However, the interfacing was also a lightweight, 100% cotton fiber content, iron-on style. I thought this was an odd combination and picked up just enough for the sleeve cuffs, the collar, and neckline facings of my blouse. I really liked how this cotton interfacing stuck nicely to the back of the velvet as well as being especially stable (being a cotton) to keep things in their proper shape. Yet, it doesn’t seem to turn out as stiff as other interfacings. I wish so much I’d bought more because I haven’t seen it again in my local fabric stores, but I know now that it is nice stuff to work with, so I’ll keep my eyes peeled…or just break down and order some online. The sole fault which I have noticed to this blouse has to do with another one of its best features…double-cuffed sleeves. They are very nice but somehow travel around my wrists as I am wearing my blouse, strangling the sleeve around the rest of my arm. This uncomfortable situation is especially apparent when I wear a coat, for some reason. I have a suspicion that this twisting habit of the sleeve cuffs is mostly due in part to the fabric, but not all blame goes to this factor. 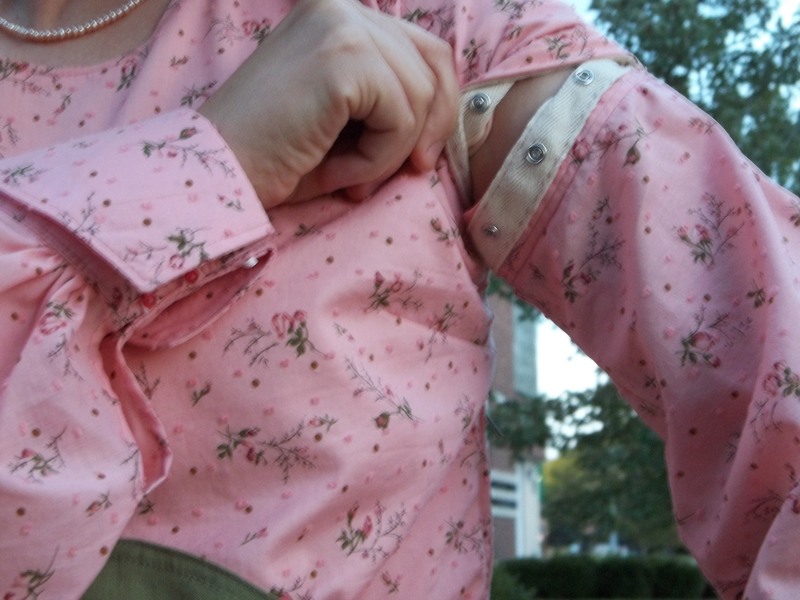 The sleeve cuffs are nice, I will admit, but sort of a bottom-heavy weight compared to the rest of the blouse. When it’s hanging up, I have to pick up the sleeves and drape the cuffs on the cross-bar of the hangar so the blouse doesn’t get its shoulders pulled down. Once being worn, the heavy cuffs aren’t noticeable but I still think not closing them tight enough around my wrists, combined with their weight, makes the sleeves twist around my arm. This isn’t something that makes me like this lovely blouse any less, it’s just a tendency that I thought it might be good to mention in case others who make this pattern find the same issue. I did slightly alter a few minor points from how the pattern instructions show to do things. My changes have to do with finishing, not design and fitting. 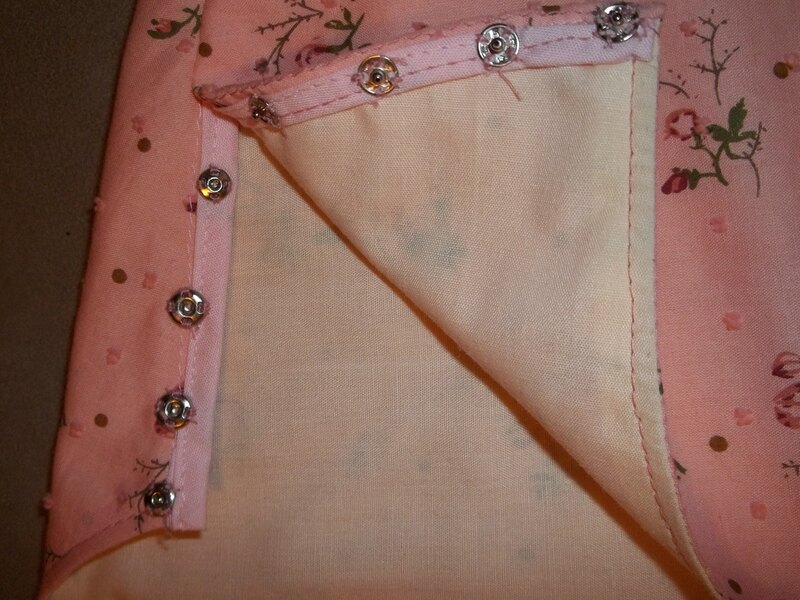 Firstly, I left out stitching in buttonholes through the cuffs. Stitching through four layers of fabric (with interfacing sandwiched in, too) did not sound like anything other than a headache, possibly ruining my fabric or machine and therefore making my project seem less than classy. Besides, I wasn’t totally convinced on the given method of folding the cuffs. As my hubby pointed out, why go to the effort of making double cuffs only to fold each cuff out in half (even with the edge where it comes into the sleeve)? Doing so creates the look of a single cuff, albeit one that is very thick, and your effort and the design seems wasted. Thus, I staggered the double-fold of the cuff at about ½ inch down (out towards one’s hand) from the edge of the cuff meeting the sleeve for a more obviously layered appearance. Then I merely took my chosen buttons and sewed them through all the layers where cuff-links would normally go. Now I am not irrevocably committed to the cuffs being one way or another. I know this method might sound cheap or sort of like cheating but the cuffs don’t feel 100% right just yet and my being happy with my own garment is one of the highest priorities in my personal sewing. The cuffs look no less elegant, so I think, for their lacking buttonholes and a little change in cuff folding. They are actually quite nicely fuss-free this way. Self-fabric belt loops are the only other item I left out in the original design. I wasn’t entirely sure I always wanted to wear a belt, or even that I wanted to always wear a belt at that same one exact spot every time. So they were left off of the side seams. I figure I can always sew in thread loops, which I think I would like better anyway as they are more low-key compared to self-fabric loops. For now, I merely use and existing belt in my collection or, as with the fancy beaded ribbon I used as belt in our pictures, use a safety pin inside to tack the belt in place at the side seams. This is another non-committal answer, I know, but one that makes me happier with the versatility and non-complexity of the blouse in the end. My beaded belt was a last minute improvisation a few days before the wedding event we were to attend. I felt the blouse need a little extra oomph to snazz up the look while still being subtle. A matching belt in the same burnout velvet seemed like overkill and would not be seen, but a basic belt or even a modern one didn’t feel right – this beaded sheer ribbon did! I used basic black satin scraps leftover from making my Christmas Burda Style draped front skirt to make fabric “caps” to cover and support the ends of the ribbon. Between the beads and the fineness of the ribbon I sewed the satin caps in place by hand. One end cap in twice as long as the other so as to close in the center with a loop and button. The button is something I picked up a while back at an antique store, and even though I do not think it is authentically vintage is darn sure looks the part of a 1920’s piece. It has the words “Costume Makers” imprinted on the back. 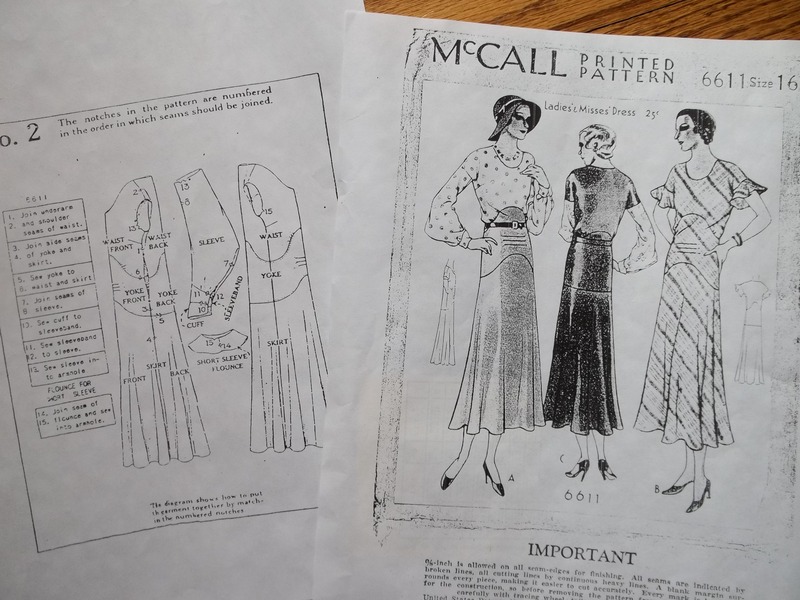 I feel McCall’s 7250 is an excellent pattern in my opinion all around, but especially for those who are just getting started into vintage or even those who are acclimating themselves to the styles of the 1920 era. It can pass as completely modern, or completely vintage, and even somewhere in between depending on how the blouse gets worn and styled with hair, fabric, accessories, and bottoms. I stayed as true to the late 1920’s as I could, with my long strand of black trumpet beads, my two-tone t-strap shoes, and my high-low hemmed, double layered under dress (a high-low hem was something which was a transition fashion easing the 1920’s into the 1930’s). However, I was also nodding to the popular Spanish-influenced or Tango fashions of the late 1920’s with my authentic 20’s era large jeweled hair comb. 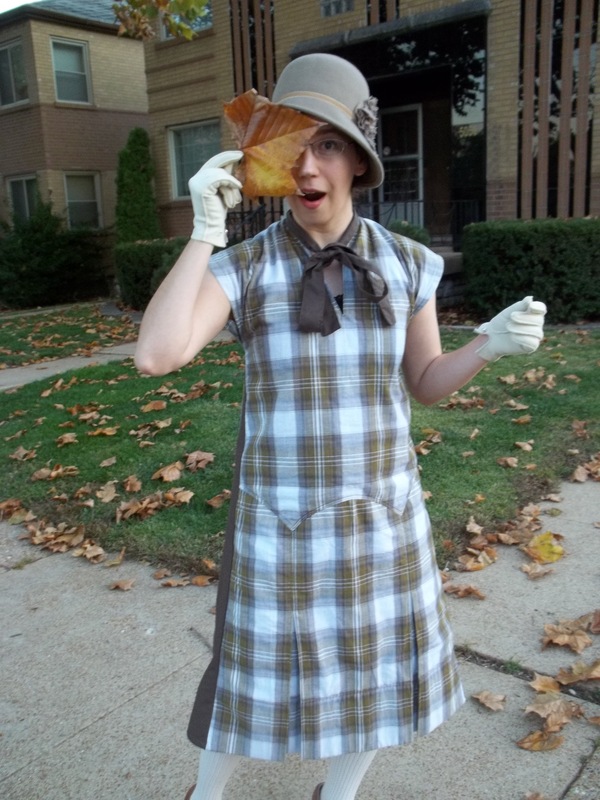 My outfit was just enough to be authentically vintage but not too much to look like a costume. This says, to me, that I found a winning piece with McCall’s 1927 blouse. Almost everyone likes a tunic top, and with this pattern there’s no more of that common “I can’t do the 1920’s” excuse anymore. You can rock the 20’s! 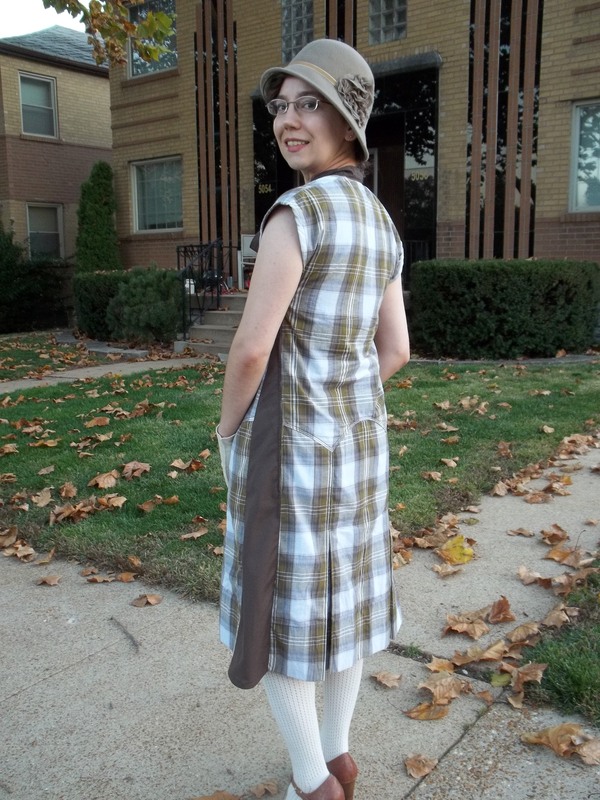 This “new” vintage dress which I have recently made is an all-around transitional piece, in more ways than one. It offers a print and fabric and colors all perfect for the varying temperatures of both fall and spring. At the same time, as a vintage/historical garment, my dress is a mix of styles and fashion ideals which were used through three decades: the 20’s, the 30’s, and the 40’s. Wow…that’s a lot to go into something to wear! It might be unusual, and certainly different – but a neat different. Two different fabric types and the ability to snap on (or off) matching long sleeves make this 1931 dress a versatile winner in my wardrobe. 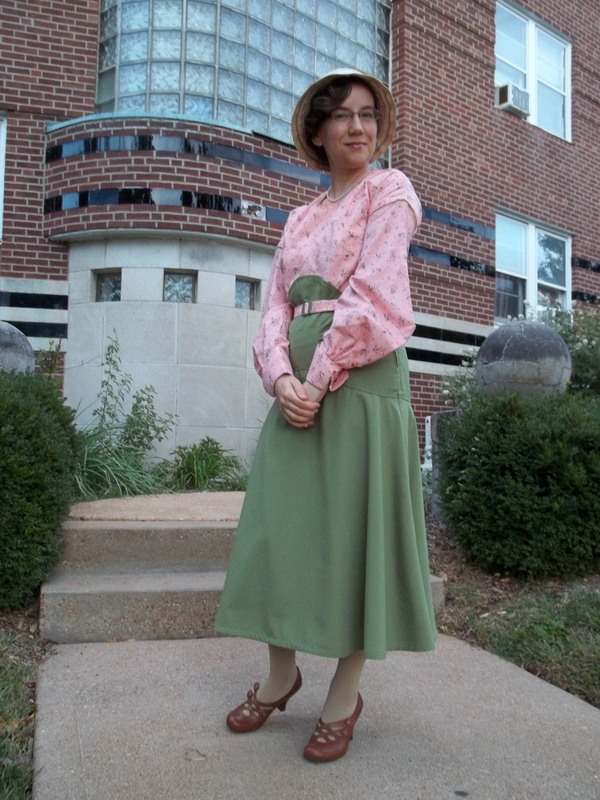 My dress has the appearance of a separate blouse and a skirt in one neat vintage project. I really love the way I can dress for cooler weather without wearing the “traditional” dark colors associated with it (see this post for another floral fall/winter dress of mine). This is an all-around comfy, easy-care, nice but casual dress. 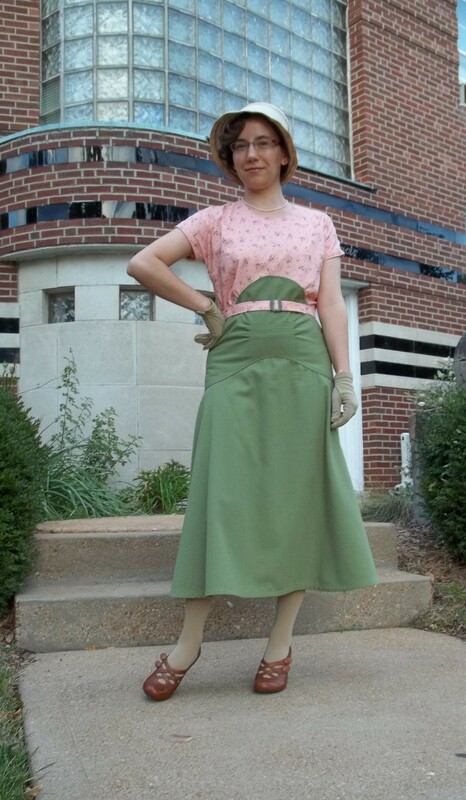 FABRIC: The olive green bottom half is in a rayon poly blend linen-look fabric, while the top bodice and sleeves are in a peach floral Swiss dot cotton. The lining for the bodice Swiss dot fabric is a orange-peach cotton broadcloth. All of these fabrics were bought at Hancock Fabrics store. My 1 1/2 yards of peach Swiss dot fabric was bought 7 to 10 years ago. It’s been in my stash for a while, and I am very glad to find such a wonderful use for it – finally! The linen-look fabric was bought spring of 2013 (last year) when I had originally hoped to get around to making the dress. This year (2014), I bought the broadcloth for the bodice lining. NOTIONS: I had on hand an old 30’s buckle, the thread, interfacing, bias tapes, and snap tape that I needed. Buttons for the long sleeve cuffs, extra snap tape, and a side zipper were the only notions I had to buy. TIME TO COMPLETE: Well, 8 to 10 hours were all it took to finish the dress, and it was done on August 23, 2014. The matching long sleeves took at least 10, maybe 12, hours to be finished on October 3, 2014. 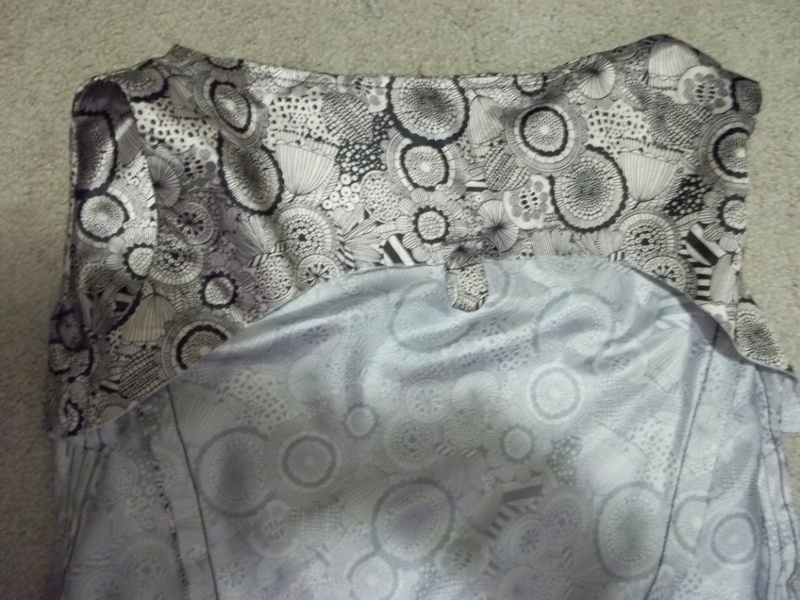 THE INSIDES: All seams except the side seams and neckline are covered with bias tape. The neckline is self-enclosed by the lining (I’ll explain later how this worked) and the side seams are left raw to eliminate extra bulk and to make it easy to do fitting adjustments. TOTAL COST: As the Swiss dot fabric was bought so long ago, I’ll count it as free. As for the only expenses, the linen-look for bottom and the other notions I bought, the grand total probably comes to $12.00 or less. The main body of the dress, without the sleeves, was very easy and quick in coming together. As you can see in the pattern picture above at left, the assembly instructions were themselves very simplistic – just one page of layout breakdown with about 8 sentences of directions. However, looking at the dress pattern pieces together with the ‘cover envelope’ picture rather makes construction self-explanatory. The only construction detail that is entirely up in the air for you, the seamstress, to decide is how to put the dress together. A basic, but semi-thorough, knowledge of different seams is needed to know (for instance) that the middle front and back panels of the dress are best when added to the skirt in a lapped method. Bias tape was also wonderful to cover the curvy seams of both the inner edges of the middle section and the bottom hem to what is a half-circle skirt. 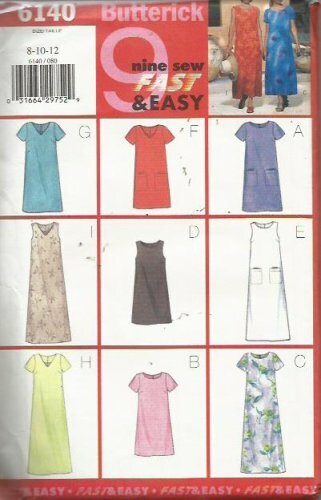 I love how these old patterns allow you to learn, expand, and use your sewing skills by providing such simple instructions. I feel it gives seamstresses more respect than laying out some detailed, dreary, and possibly confusing directions. Granted, I know complicated instructions are needed and quite useful sometimes. It’s just that sewing in an advanced form used to be common knowledge years ago, thus old patterns were created for such a person. Those of you that feel comfortable with your skills, will also enjoy making these old patterns with simple instructions. 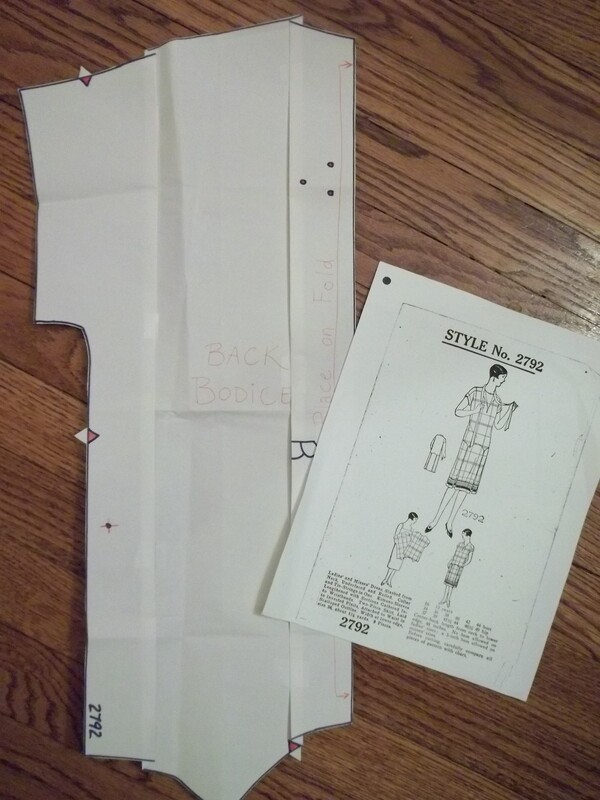 There are only just a few points in constructing my 1931 dress where I deviated (just a bit) from the assembly diagram to personalize and accommodate my taste. To start with, I sewed the front and back neckline first – yeah, first. I wanted the neckline to be nicely self-enclosed in between the Swiss dot and lining cotton by sewing the seams right sides together, clipping the curves, turning out, then top stitching in place. 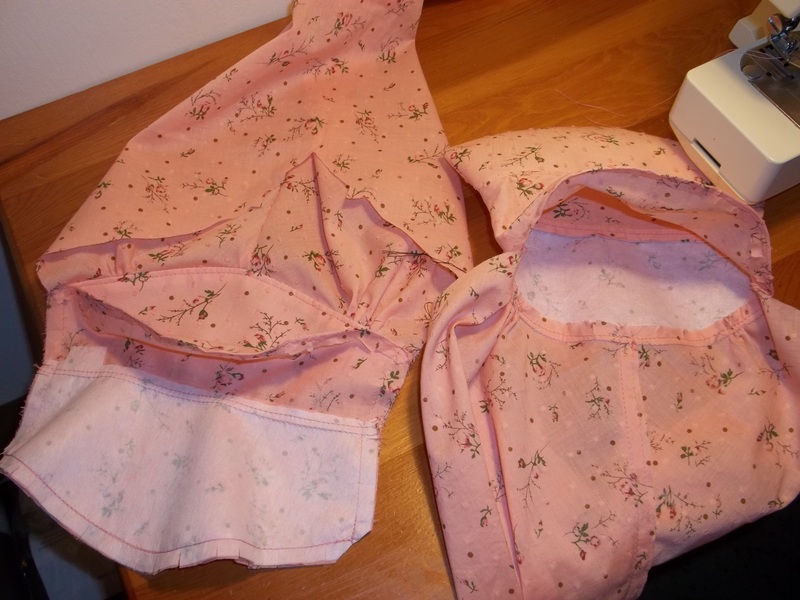 As I had raised up the scoop neck by about 1/2 inch, I had trouble fitting my head through, so I had to unpick several inches in from the neck to add a snap placket to the left shoulder seam (see picture below). I hate sewing in snaps…this part of the job was tough. The length of the skirt was also extremely long which necessitated a chop off of about 3 1/2 inches to reach the proper mid-calf length. Fitting is very important when it comes to making this pattern reprint. The dress needs to be slightly roomy everywhere else except the hips. I saw on the front of the ‘cover envelope’ drawing that the pattern specifically pointed out that “this garment fits closely at hips”. O.k., I thought to myself, I need to grade the pattern down to my size, so I’ll make sure to get close but maybe just a little big when it comes to the fit. You can always take something in, but when something too small…well that’s a problem. Just so as to make fitting this dress to my body easy, I did something different from the construction instructions – the entire front pieces and then the entire back pieces are sewn up in two separate, full dress length panels. This method left the two side seams (with a zipper in the left hip/waist) the very last thing done to complete the dress. 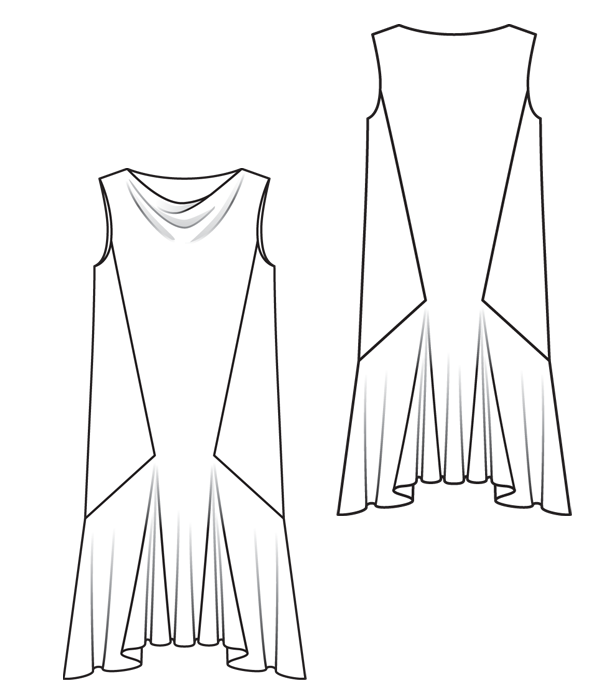 With three sections composing the length of the dress, there would be no way to adjust the sides if done otherwise. In the finished dress, my down grading sizing turned out fitting perfectly, but I finally realized (once it was on me) how important it is to fit snug on the hips. 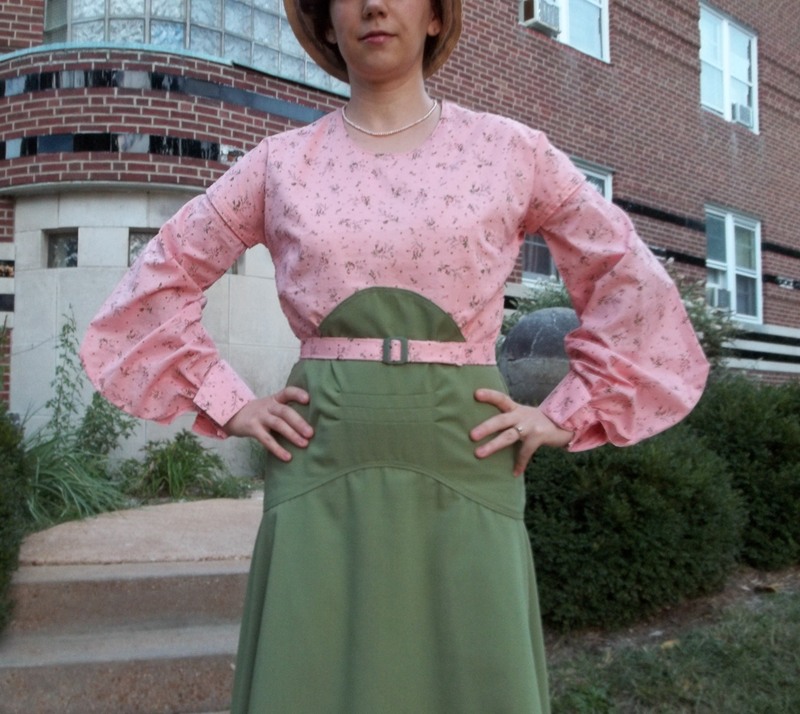 The bottom skirt is rather heavy, and, without the tight hip fit, the whole dress gets weighed down, thus losing the proper “blousing out” of the upper bodice. There is a delicate balance trying to find a good hip fit for this dress – tight enough to hold the dress where it should be but not too tight to rip seams or make the dress wrinkle up uncomfortably. After a handful of trial and error attempts, I feel I have found the perfect hip fit (for now at least). 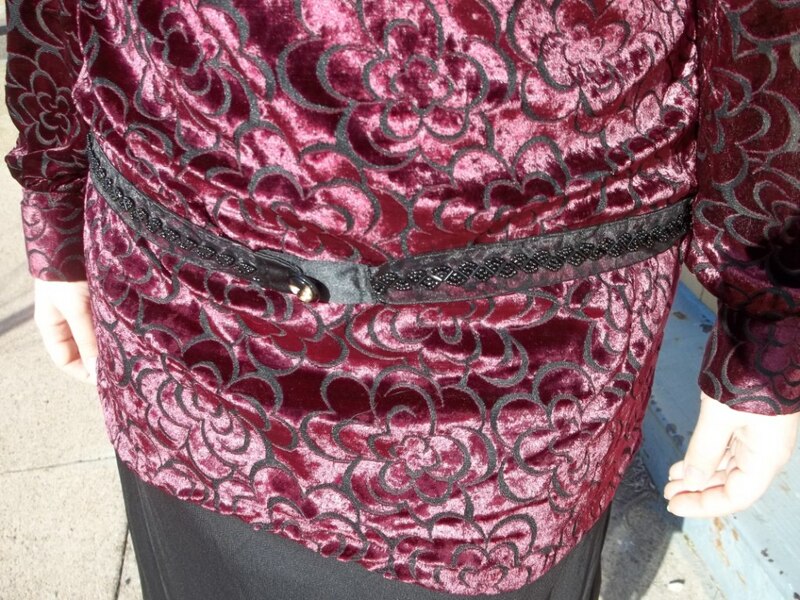 Having a belt, especially when you can use an old 30’s buckle like I did, also helps to hold the dress up in place and balance out the harmony between the two fabrics. I finally did an experiment with the belt I made to match my dress, one which has been in the creative “back-burner” of my mind. Before I sealed off one end, I slipped in a venetian plastic window blind slat in to the long belt tube. Of course the blind slat is stitched in place at the ends, but at least this way I have a bendable but sturdy belt on which there is no top stitching or interfacing. It sounds strange, I know, but it works, and I like my idea…although I probably will not do it again. I really find the silhouette of this dress even more dramatically interesting with long sleeves. 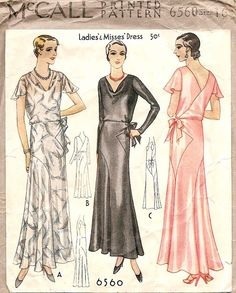 This dress does nothing for the bust or the shoulders (a very 1920s characteristic) while the long vertical emphasis of both the fit and the design of the main dress body stresses the hips (also of the 20’s) and lengthens the body (late 20’s). With the long sleeves on the dress, they further the vertical emphasis, but widen it slightly, by beautifully drawing attention to the hips in a very unique manner. I can’t figure out the reason for the three horizontal pin tucks – I can only think that they balance out the vertical lines of the dress. The little bias flare of the bottom gives it a slight 30’s touch and the blouse top with its kimono sleeve style and U-neckline is definitely very 40’s (see my version of this blouse). Besides all the styling, the use of Swiss dot fabric is very authentic for the era. See this post by Marianne at Fintage for a classic example of the 30’s beautiful use of Swiss dot fabric. When it came to making the sleeves, there are absolutely no instructions whatsoever. As long as you know how to make sleeve cuffs, this is not a problem – how to achieve the look of the cover drawing was the cause of consternation. The pattern pieces do not clarify how many pieces to cut out of the cuff and the sleeve band. Thus I ended up cutting out four of each cuff and sleeve band (two for each sleeve) and one each of interfacing. 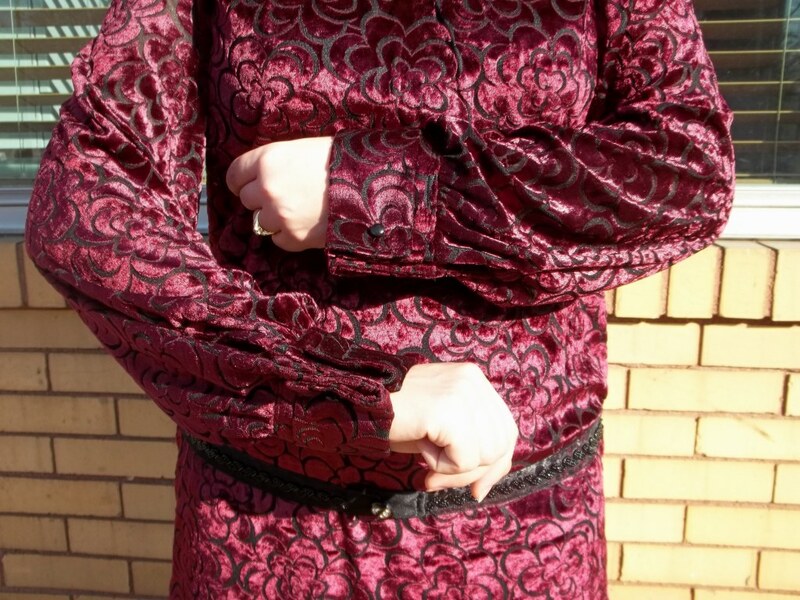 According to the cover drawing, the cuffs looked like they are supposed to be in a turned back style, so I was going to face the cuff and sleeve band pieces with interfacing inside to achieve that look (see the left picture). I believe my method to be the correct way to have done the sleeve cuffs, and, although I can’t guarantee this, the way they turned out is truly lovely with the way they curve. The stable sleeve cuffs make for a nice finish for the poufy “bat wing” style sleeves above them. At first I was concerned that the sleeves hang too low on my arms by the way the seam ends an inch or so below my elbow. Looking at the cover envelope drawing again confirmed for me that they are supposed to fit that way. The sleeves take a bit to get used to once they are on just because I’ve never had anything like them, but it doesn’t take long to love wearing them! Tiny 1/4 inch coral pink buttons close up the inner cuff of my sleeve band. Since I didn’t included a closure method when the cuffs were made, I got inventive to make something work. Braided thread loops are great but are time-consuming. Time was something I wanted to cut down on at this point. So, I threaded a tapestry needle with 1/8 inch light pink satin ribbon and wound it through the cuff seams making three loops. It looks dressy and it was easy at the same time. 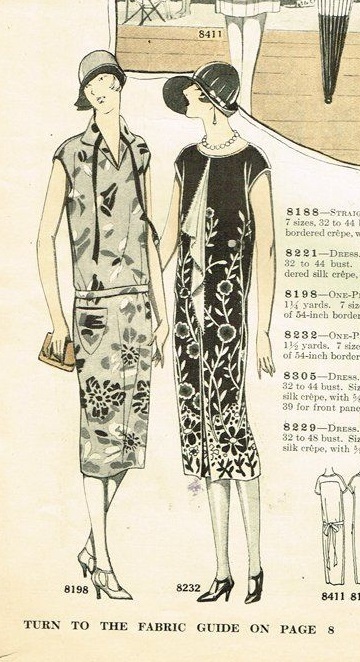 My idea for snap on and snap off long sleeves came from seeing this feature on an old 1920’s pattern. How ingenious and versatile, I thought! Nothing extraordinary was needed to do – the short sleeves were hemmed like a normal sleeve, and the long sleeves had a small band sewn on to both finish the edge and give room for the snap tape. Sewing on the snap tape to the sleeves and getting both sides to match snaps was a long, time consuming, hand sewing torture that was made better by getting it done in the car. Nothing like getting the most out of my passenger time to get my hand sewing done! It really made all that hand sewing fun to do it in the car. I want to do more sewing during car trips! I’m wondering if a 1931 lady would have been able do sew as a passenger in their cars. This project was unknown territory for me. It certainly brought me out of my comfort zone which is a good thing. I thrive on a challenge and it helps me hone in on my skills. My 1931 dress is one that is a surprise to me. Every time I wear it out and about, I get a bit unsure and self-conscious thinking that it is too-vintage or unusual, but then I always seem to receive a positive compliment. All I know is I think I’ve re-discovered a piece of history long over looked and forgotten. I’m a lucky girl to get to make and wear such a piece. Anyone care to join me and sew up their own version? Our photo shoot’s backdrop is a neighborhood apartment complex, which has the name “Crystal Tower” due to a superb use of decorative glass in the vitrolite tiles and blocks. It is wonderful example of how everyday living had a touch of Art Deco glamour in the 1920’s, 30’s, and 40’s – the three decades included in my dress. Perhaps, if you search in detail behind me in our pictures, you should see the “Crystal Tower” logo with its nautical cursive theme. Even though the building was actually built in 1940, towards the end of the Deco style period, the building materials and design had been used similarly for a decade or two before, so our backdrop is authentic to my 1931 dress (historically speaking). There is an excellent blog page at B.E.L.T. Stl which shows more details of the “Crystal Tower” apartments, if you’re interested. For using such a homey, down-to-earth place for a photo shoot, I certainly think it neat to see such forethought and attention to detail in vintage construction. Look forward to more of these Art Deco era living places in some upcoming blog posts. As always, please check my Flickr site, Seam Racer, for more pictures.